Guess what? 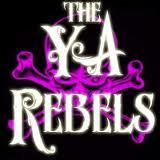 I’m going to be a guest vlogger on the YARebels for today and every Wednesday for the month of August. This week on the Rebels, we are talking about Independent Bookstores. There are actually two Indies in the Orlando area (Thursday is taking B&L) and I did a spotlight on The Book Worm. So check out my vlog and then go out and shop at your local Indie! Awesome! Can’t wait to “see” more of you. The vlog series sounds fun. Great job with this one, Christina! I love your points about indie bookstores. Nice job, and great way to promote indies. I love lima beans, too. Thanks! It’s all very new to me this vlogging thing. And many thanks to my nine year old for filming it because hubby wasn’t home!